My purpose in this portofolio is to present the ethics and priciples of permaculture. I have concentrated on its cultural and social dimensions. I will tell how it affects society and lifestyle. As an example I will introduce my family’s permaculture project Iso-orvokkiniitty. Enviromental threats: threats by human influence which cause permament damage to the balance of nature. Biodiversity: diversity in nature at different levels, for example genetical, populational and ecosystems levels. Ecologial succession: change process of species in ecological communities. Fossil fuels: millions years ago in the ground stored dead plants and animals which can be used as a fuel. Example oil and coal. Renewable energy and resources: energy and resourses from nature which renew in reasonable time. Example of renewable energy are solar and wind power and examples of renewable resoursec are wood and water. Feedback: feedback is a process where outputs are fed back as inputs. Thus forming a circle or loop. Elements: individual parts that make up a system when connections exist between them. Pattern: self repeating model in space and time. Natural capital: stock of ecosystems yield and services which humans can use. Energy descent: decreasing availability of cheap energy. Self-reliant: means being able to provide for own basic needs indepentedly. Monoculture: a specific area that grows only one species. Polyculture: a specific area that grows many species. Function: the goal we want to achieve by using the system. Edge: place where two elements meet. Example shoreline and forest edge. Marginal: means elements which have less apparent importance to the system. 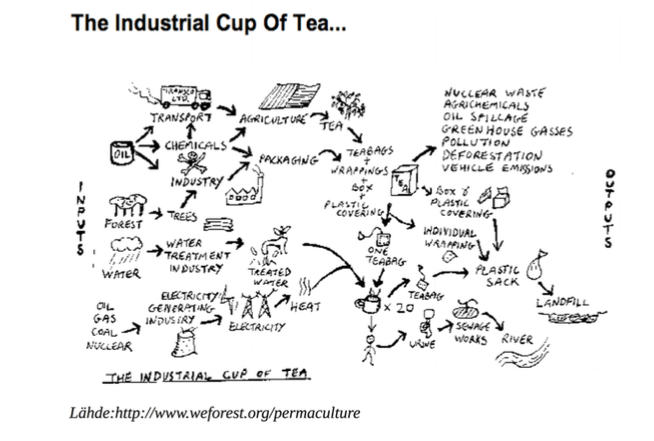 Permaculture is trying to answer some of present-day’s problems. The main idea is to do things for making this world better – not only complaining about problems. It could be called positive criticism because the main focus is on what we can do, not on what we can’t. In permaculture ideas, skills and lifestyle which make possible to take our life in our own hands are united. 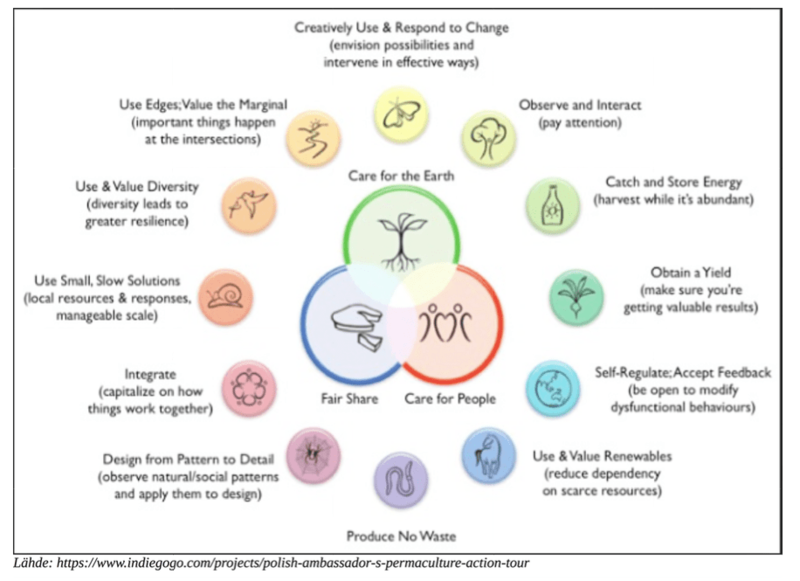 The founders of permaculture are Bill Mollison and Daivid Holmgren. David Holmgren is author of the book which I used for preparing this portfolio. 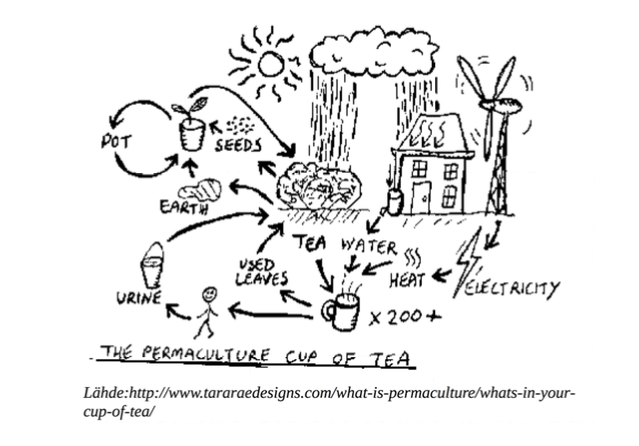 Permaculture is quite a large consept. It can be ethical, practical and philosophical. 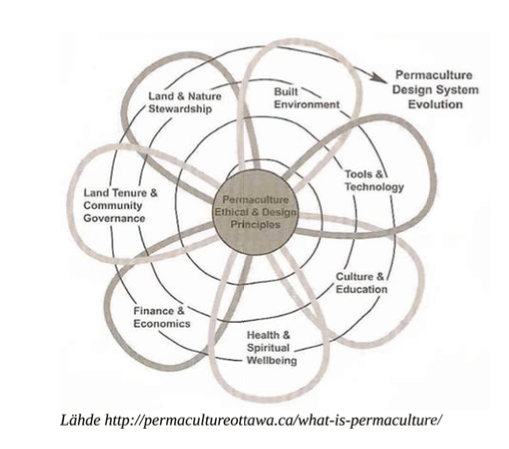 The word permaculture is from permanent culture but first it was permanent argiculture but the concept now includes culture in a broader sense. Key problem to which permaculture attempts to find a solution is energy descent. Our high living standard is based on fossils fuels and cheap energy in general. Availability of cheap energy is decreasing and because of climant change we should stop using fossil fuels anyway. Today’s industrial societies impact is going to be huge compared to the last couple hundred years. The result of the energy descent world is that we must diminish our energy consumption. Permaculture is inspired by traditional societies because they have lived in balance with nature longer than any modern society. We must take responsibility of our actions and life. Work with nature not against it: We should learn from nature and cooperate with it. Example: If I have snails in my garden and they eat all our vegetables it is not a problem, we only need some ducks. Seasonal eating is also a good example. Minimum effort for maximum effect: Think how we can do less work and still gain good yield. Example: perennial plants. Once planted they will produce many years. Instead of making a big effort to collect food for the animals let them go out to the fields and feed themselves. Everything gardens: All what we can find in the garden can be usefull. Example: birds are eating pests. Also example pigs love to do the tillage for you. The yield is unlimited: We should use our imagination in our production. Example: birch can be used in many different ways: wood, whisk used in sauna, sap, bark for tinder or handcraft. The problem is the solution: We should think of problems as a opportunity. Example: weed can also be good food and city horses produced manure can be used as a fertiliser in city gardens. Good designing need’s observation and interaction as a source of inspiration and action’s models. They are used to reduce physical work, non-renewable energy use, high technology. They are tools for desiging. We have to save natural resources for future generations by using renewable energy resources and energy saving tecnology and energy saving lifestyle. For example of energy saving lifestyle is seosanal eating. New ways of production is important when we decrease the use of material. We need to have yield now even though we plan long term. In order to make better choices for our wellbeing we should know were our resources come from. We must adapt to change of yields and crops (seasonal food). Resources should be used carefully but so that efficiency doesn’t suffer too much. The world is a self-regulating system. In permaculture we try to develope self-regulation and self-sustaining systems becouse they sustain disturbances better. For example a tree can be used in several ways like for fire wood, building material or mushroom growing as well as using its services like shade. Someone’s waste is food for someone else. We design systems so that all waste is used as a resource and we should not produce any pollutions. By observing we can find the most useful patterns. 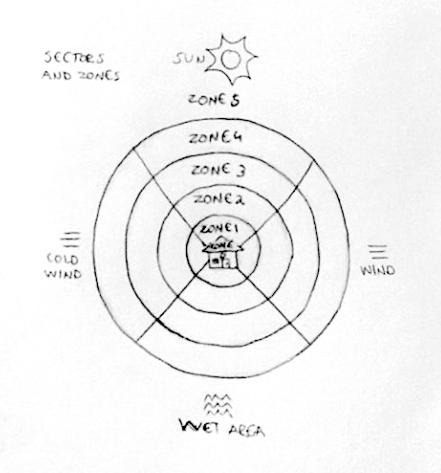 Zones and sectors are key tools for permaculture design. Zones are defined by how often you need to visit it. Sectors are defined by environmental conditions. In nature we can observe that connections between elements are as important as the elements itself. 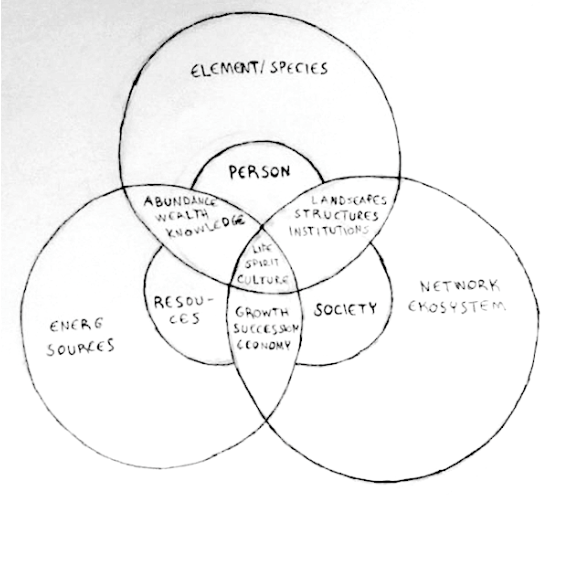 In permaculture we should design so that elements benfit each other. Large scale systems are based on cheap energy. That’s why small systems are more efficent. The human scale of understanding and control should be the yardstick for a sustainable society. Polyculture is not as vulnerable as monoculture and that is why permaculture prefers it more. Not only nature’s biodiversity is important but also diversity of cultures and languages. Edges have higher diversity and therefor have higher porductivity. When the focus is on prime aghricultural lands and main crops for example the needs of the poor in the developing countries and the destruction of wild species and marginal areas are ignored. Future innovations come from places where the problems are encountered today. This fact is ignored when the focus is on big business and afluent urban centers. Constant change on micro level enables the makro level to remain stable. There are changes to which we have to adapt and there are changes which we can make use of. For example we can accelerate sucession. Innovations spread in society often happens similarly to ecological succession in nature. My parents bought a piece of land from Karjalohja called Iso-orvokkiniitty. It consists of a site with building rights, field and forest. My elder brother who studies architecture is designing a natural ecological house for the site. My parents are planing to produce most of their food. They already have raised beds (for vegedables), bee hives and mushroom cultivation. We have built already a dry toilet from old logs. They have installed a solar panel and they are planing to build a wind mill. In the forest there is a hazelnut grove.